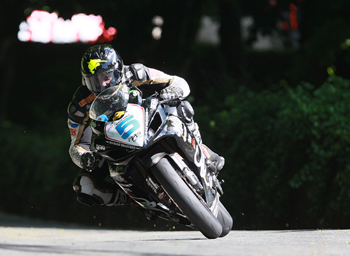 Bruce Anstey overcame the disappointment of Monday’s disqualification to finally take his 7th TT win, dominating Wednesday’s 4-lap Relentless Supersport 2 race. The Kiwi rider overcame a strong challenge from Ian Hutchinson in the early stages to pull clear at half race distance and he ran out a comfortable winner by 34.04seconds. Hutchinson finally got some luck as he took an excellent second place whilst there was also joy for Ryan Farquhar who took third, thus making it three nationalities and three manufacturers in the top three. The riders were met with bright, sunny conditions although there were blustery winds all around the course but it was Hutchinson who set the initial pace and he led at Glen Helen on the opening lap, albeit by just 0.4seconds from Anstey. John McGuinness was third followed by Guy Martin, Ian Lougher and Farquhar but Keith Amor was clearly in trouble, down in 11th, and he got slower and slower as the lap progressed, eventually being black flagged at the Bungalow for touring. 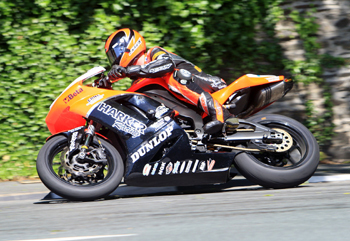 Monday’s race winner Steve Plater was also having problems and he too retired at the Bungalow. Hutchinson completed the first lap at 124.126mph to lead Anstey by a miniscule margin of 0.82seconds but McGuinness was out, the Honda rider retiring at the pits with an oil leak which meant that the top 3 from Monday’s corresponding race were all out. Anstey made his charge on the second lap and with a new lap record of 125.372mph he rocketed clear to lead at mid race distance by 11 seconds. Hutchinson maintained second but Farquhar was now up to third ahead of Martin, Gary Johnson, who was having yet another great ride, and Lougher. Anstey was clearly keen to make amends for Monday and he continued to extend his lead between all of the commentary points whilst Hutchinson, mindful of 2 retirements already this week, began to ease back slightly to ensure his Yamaha engine lasted. Meanwhile, double race winner Cameron Donald was another high profile retirement, the Australian grinding to a halt at the Mountain Box. There were no such problems for his illustrious teammate though and Anstey brought his Relentless by TAS Suzuki home over 30 seconds clear with Hutchinson taking his seventh TT podium in second. Farquhar’s excellent week continued in third, his first TT rostrum since 2005, whilst there was another solid ride by Ian Lougher in fifth. Johnson came through for fifth as a slowing Martin slipped back to sixth. Local man Conor Cummins finished in 7th ahead of the brilliant Michael Dunlop, Adrian Archibald, Dan Stewart, Roy Richardson and Mats Nilsson. The newcomers again had superb rides with James Hillier in 17th, Jamie Robinson 18th and Alessio Corradi 35th. Roger Maher and Craig Atkinson were reported as OK after incidents at Governors Bridge and Ginger Hall respectively while James Hillier eventually finished a credible 17th despite coming off at Signpost. Download the Relentless Supersport race two lap-by-lap and final results in PDF format below.